“If this president is re-elected, you are going to see chronic high unemployment for another four years or longer,” he added. Later, Romney reminded everyone that General Motors did, in fact, go bankrupt as part of President Obama’s plan. Romney said that he wanted GM to go bankrupt six months earlier which would have allowed their recovery to begin even more quickly. This gave Mitt Romney an opportunity to repeat his convention speech line, “I am not in this race to slow the rise of the oceans or to heal the planet. I am in this race to help the American people.” Speaking of the conventions, he defended the Clint Eastwood speech, and he said Bill Clinton’s speech “elevated” the Democratic Convention. Later he said he would maintain defense spending at the current level of GDP. Then he tried to tag the pending “sequestration deal” as being a White House plan. Host David Gregory corrected him, pointing out that this a bi-partisan agreement. Later, in the roundtable, Gregory reminded all that the GOP vice presidential nominee, Congressman Paul Ryan (R-WI), voted for sequestration and spoke out in favor of the plan. Romney repeated that his plan to eliminate tax loopholes and deductions for the wealthy would give a revenue neutral outcome. But when Gregory pushed Romney for one example of a loophole he would close, Romney did not answer. On healthcare reform, Romney seemed to say that he would push for a new reform plan that preserves many of the most popular provisions of President Obama’s plan. On foreign policy, Romney said President Obama’s failed approach on Iran has left the world less safe. “I don’t think we can live with a nuclear Iran,” said Romney. In what I think might be the most telling exchange in the interview, Gregory asked, would a President Romney fight to overturn Roe v. Wade? Romney gave a softer answer than usual. He said he recognizes that there are two lives involved in an abortion decision, the unborn child and the mother. “I believe people of good conscience have chosen different paths in this regard, but I am pro-life,” he said. 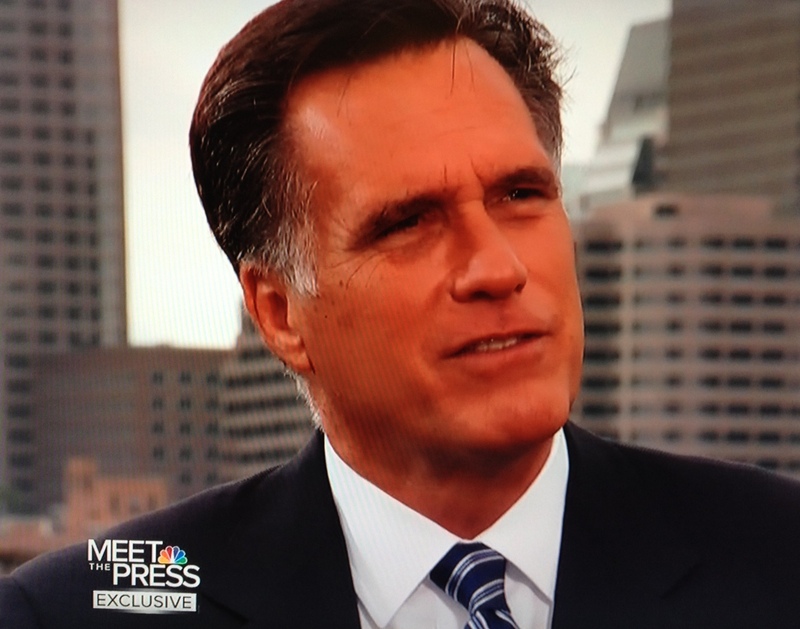 It seemed to me that in his tone and word choice (on abortion and healthcare among other things) there were small signals throughout this interview of a possible pivot to the center, with a more confident Mitt Romney willing to appeal to independents even if it causes a little heartburn among the most conservative. If such a pivot had begun before the conventions, it might have made a real difference in the poll numbers. Now we have to wait and see if the pivot is real, if it sticks, and if it matters. Today’s roundtable was shorter and more devoid of insight that usual. But two comments are worth noting. Republican author and speechwriter Peggy Noonan suggested that before the debates, Romney has to find a way to define himself as very separate from the George W. Bush Administration and their way of governing. She said this is more important for Romney than worrying about his likability. NBC’s Chuck Todd said that, in the polls, President Obama was ahead before the conventions, and he remains ahead after the conventions. NOTE: This was the first Meet The Press broadcast to be live tweeted by an NBC News staff person. Check out @AndrewNBCNews to see the results. No word on wether or not this will be a permanent feature of the program.